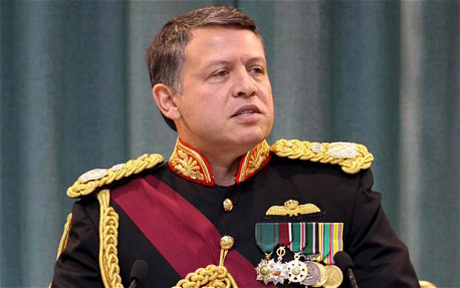 Jordan's King Abdullah vows to destroy ISIS "The only problem we’re going to have is running out of fuel and bullets." This is it...They need to use the USA\Coalition advice on strategic and frequent targeted attacks rather than angry and unplanned revenge\anger, people appeasing attacks...The USA helped them with location and precision targeting on Thursday by escorting Jordanian bombers...Its the way to go. I like that is Jordan initiating and leading this, and the US assisting. We stick our necks out too much, and yes, the President's of the past have made horrible mistakes that have caused issues presently, but it's time now to focus on the world all fighting ISIS together. It truly is us, as in the world, against them. As 'refreshing' as this may appear at first blush, it is merely a shallow/hollow gesture. The only problem is the moo slum Death CULT. The only solution is the complete abandonment, destruction and removal of all things moo slum. Otherwise, we'll continue to see this non-stop cycle of cr*p from the ignorant insane moo slums. And, yes, this includes the equally ignorant insane supposed 'moderate' moo slums without whose support none of this would have happened. I found it interesting that the King said "ISIS does not represent Islam. ISIS are not human" (or something to that effect) and basically he said he is ridding Jordan of all the ISIS supporters and anyone who supports these acts. He even went so far as to say that ISIS is not representing Islam and they should not be called Islamic Extremists, as they have nothing to do with Islam. He implied ISIS is defying the Koran and they don't even deserve to be called "Islam" in any way. He is planning raids in Jordan that target any one who supports ISIS. They will not be allowed to remain a citizen of Jordan. I think he is trying to show there is a difference between civilized society, and the whacked out ISIS nut jobs who are claiming that this represents Islam and Muslim beliefs. Don't quote me, but it was along those lines. Honestly, this fucked up situation is only going to be a burden for our children's children to still live with...something needs to change. Although not the worst in the region Jordan has a pretty poor record on human rights. And the King appoints government not the people, but it is tolerant of other religions....He does make sure their are 11 seats for Christian government ministers. CNN is saying that an American female hostage was killed in Syria during an air raid by Jordan. ISIS claims this. I don't believe it. If she is dead, they most likely killed her days ago.